In the lead-up to Enterprise Connect, industry analysts and press often receive pre-briefings on products vendors are announcing and demonstrating at the event. Last week, for example, I wrote that Thrio, a new artificial intelligence (AI)-powered contact center-as-a-service (CCaaS) platform, would be demonstrated live publicly for the first time on the Expo floor (1543). 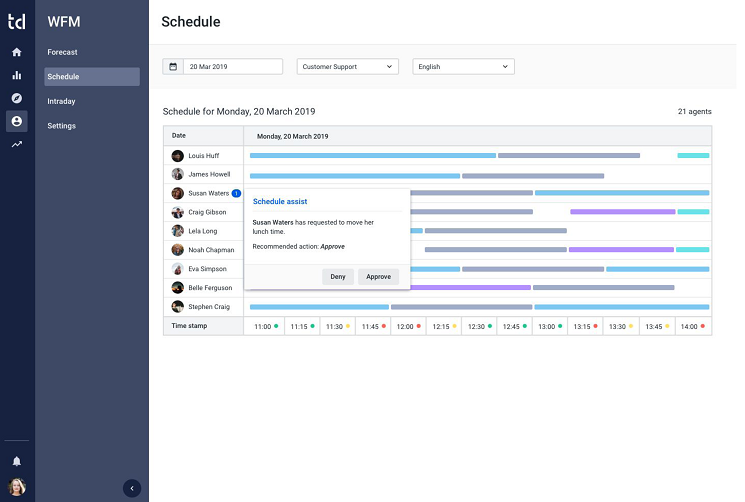 This week I’m equally excited to share that Talkdesk is adding a new pillar to its customer experience portfolio -- workforce management (WFM). While we’ve seen several companies, like Thrio, enter the CCaaS market with shiny new microservices-based solutions, WFM vendors have, for the most part, been addressing the move to the cloud with variants of their premises-based applications. Note that Ytica, acquired by Twilio in 2018, took a similar start-from-scratch approach to building the other two pillars of customer experience -- workforce optimization (WFO), and quality management and analytics. I’m excited to see Talkdesk throw the proverbial Erlang C book for predicting call center load out the window and instead build an artificial intelligence (AI)-to-the-core WFM application as an extension to the Talkdesk Enterprise Contact Center. But I did wonder about the company’s WFM, so that’s one of the first questions I asked during the pre-briefing. What was the makeup of the team Talkdesk had assembled to build its WFM solution? Jason Fama is leading Talkdesk’s WFM product development charge. Fama worked in WFM between 2000 and 2016, starting at Blue Pumpkin, which Witness acquired in 2005 (with Witness itself being acquired by Verint two years later). Given the AI focus of the Talkdesk WFM development effort, Fama’s next three years at Directly also seem to have been part of the appeal in bringing him on. Directly describes itself as being in the CX automation business, “experts at the heart of AI.” Talkdesk WFM’s marketing lead, Patrick Russell, who led my briefing, has a solid background in WFM. He joined Talkdesk after spending a few years at NICE inContact. Working with these product and marketing leaders, I’m told, are teams with similarly rich backgrounds in contact center and WFM. My next question: Why is Talkdesk building WFM? Most of the CCaaS companies partner for WFO capabilities (Genesys and NICE inContact being notable exceptions), and in fact Talkdesk has several WFM companies in its AppConnect program, including Teleopti and Loxysoft. In addition, WFM is thought of as very “sticky” -- i.e., companies don’t like to disrupt their workflow with new scheduling solutions and often stay with the same solution for many years. AI isn’t new to WFM -- several companies are delivering or working toward applying machine learning to WFM scheduling tasks. Genesys, NICE inContact, and Verint have all announced AI WFM efforts. But each of these companies has been in the contact center space for more than 20 years, and bring a fair amount of acquired, often premises-based technology, to their efforts. As seen in the screenshot above, that’s exactly what Talkdesk is building. Visit Talkdesk at Enterprise Connect booth 1927.